Superman has turned himself in for manslaughter of over a thousand people. Wonder Woman arrives at his jail cell to comfort him but the Man of Steel is inconsolable. Meanwhile in a safe house hidden somewhere in the country Major Disaster and Faith cry to themselves in secret. Their actions, Faith's uncontrollable energy powers, have laid waste to a thousand people; many of whom were children. At the Safe Haven meta-human compound that now lies in ruins, Batman, Atom and Fire Storm search for clues as to what exactly happened. Manitou soon arrives to lend a hand. The lack of physical evidence leads Batman to turn to the Shaman's mystical powers for help. But the use of magic reveals that there are no angry souls left hovering in this plain of existence waiting to pass over. No one died here. Meanwhile the Martian Manhunter and Scorch continue their "therapy." She's trying to help him over come his psychological weakness to fire and she needs him to help her make sense of her muddled memories. Unfortunately Scorch's thoughts are just like flames, which makes it hard for the Manhunter to continue. Back at their secret safe house, Faith is intent on calling for help from her former boss. The black ops boogie man, Mason, is the only one who can help them now. In an undisclosed location elsewhere, Mason holds court with his metahuman soldiers. Two of whom look very familiar as they were once introduced to us as Shepard and his wife, head masters of the compound. Jon Stewart appears to be there to, held captive and silent by his own powers. It's time for Mason's team to take down the JLA. Batman, Atom, Manitou and Fire Storm make their way acrosss the country airborn. Suddenly a low level controlled nuclear explosion knocks the bat plane out of the sky. A series of attacks from unseen attackers come from every angle. The JLA members fall back and regroup just as their attackers show themselves. They're AXIS AMERICA, and they're here to replace the JLA. Story - 4: The story is just as interesting as the issue before. A few answers are given and a few more questions are asked. The overall plot is progressing nicely and every JLA member is being given a role without it seeming forced or deliberate. However, there are a few fast/jumpy transitions that really drag the story down. Art - 5: Duncan's art is once again fantastic. I'm particularly taken with his Martian Manhunter. I only wish we'd get to see him in action. Plus Mason and his crew look great shrouded in shadows, the finally full color reveal of Axis America was stunning. 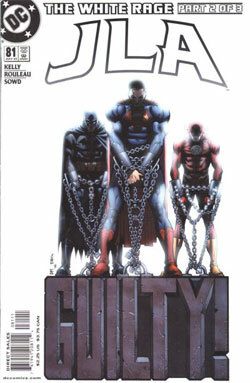 Cover Art - 4: Top guns of the JLA in dramatically stylistic chains is an awesome representation. Standing them on top of a large granite "guilty" is a bit glib. The stark background actually works well this time especially accompanied by the white JLA logo.